By this point of the summer, many of us are suffering from rosé fatigue and can’t stand another glass, whether it’s flat, sparkling, or frosé. That doesn’t mean your only other option is white. Contrary to snobby old-school wine rules, not only can you drink red wine any time of the year you wish—you can also chill red wine. And it can even improve the flavor of your drink. “Chilling the wine makes it a little more refreshing and crisp,” says Pat Henderson, chief winemaker for Kenwood Vineyards. Another reason to drink red wine in summer: It pairs seamlessly with backyard cookout entrees. “Lighter-bodied reds such as zinfandel bring out the great flavors of grilled meat, preferably cuts with higher fat content,” Henderson says. But don’t go all-out and start storing every bottle of merlot, tempranillo, and cab in the freezer with your vodka. 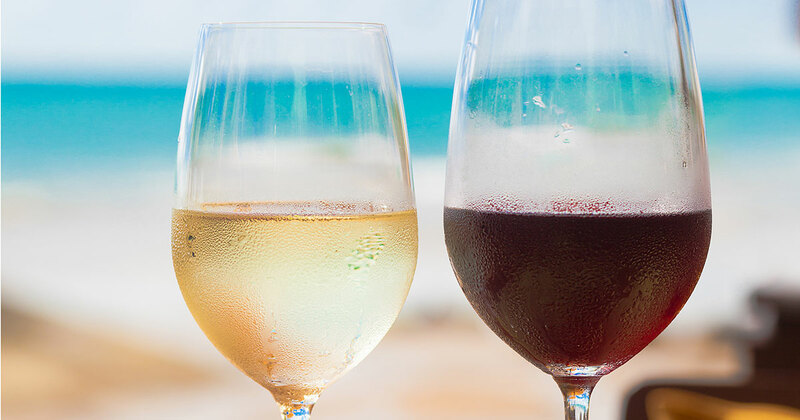 For best results (read: tasty, full-flavor wine that keeps you coming back for another sip), follow Henderson’s expert advice. Not all varietals are ideal for chilling. Putting a bold cabernet sauvignon or malbec in the fridge will cause their tannins to tighten, leading to a very bitter wine. Instead, Henderson recommends fruit-forward reds like pinot noir, gamay, or sweet zinfandel. Younger wines are also better than older ones, because younger wines have a riper fruit flavor, he explains. 2. Don’t go too cold. “There’s always been a misconception that red wines should be served at room temperature,” Henderson says. “At the same time, having a red wine too cold robs much of its flavor.” So how cold is too cold? The sweet spot for vin rouge is between 58 to 60 degrees Fahrenheit. “At this temperature, the palate is a little more lively without the loss of aromas or flavor,” Henderson explains. To reach that sweet spot, Henderson recommends chilling a red in the refrigerator for 20 minutes before serving. That way it cools but doesn’t get too cold. And if you picked up a bottle on the way to a party, don’t try to speed up the cool-down process by tossing it in the freezer when you arrive. “You run the chance of over-chilling the wine, leading to loss of the wine’s aroma,” Henderson says. Instead, place it in a bucket of ice for four to five minutes when you arrive at your friend’s place. That’s long enough to lower room-temp wine to nicely chilled. If you don’t polish off the bottle, Henderson says to use a vacuum pump, which will give you another two to three days to drink those remaining glasses. Another option is to pour the wine into a 375-milliliter bottle, seal as tightly as possible, and chill that.